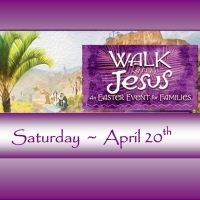 Join us as we "Walk with Jesus" through His last days on earth. It's an Easter event for the whole family! We will travel to Jerusalem for Palm Sunday, sit down for the Last Supper, discover the sacrifice of Good Friday and celebrate freedom from our sins at the empty tomb that first Easter morning. Contact Connie MacDonald for more information.